Joan Baxter’s topical book, “The Mill: Fifty Years of Pulp and Protest” (Pottersfield Press, 2017), will be launched Thursday, November 16, 2017 at the Wooden Monkey, 305 – 40 Alderney Drive, Dartmouth. 6:30 – 9 PM. The Mill –Fifty Years of Pulp and Protest explores the power that a single industry can wield. For fifty years, the pulp mill near Pictou in northern Nova Scotia has buoyed the local economy and found support from governments at all levels. But it has also pulped millions of acres of forests, spewed millions of tonnes of noxious emissions into the air, consumed quadrillions of litres of fresh water and then pumped them out again as toxic effluent into nearby Boat Harbour, and eventually into the Northumberland Strait. From the day it began operation in 1967, the mill has fomented protest and created deep divisions and tensions in northern Nova Scotia. This story is about people whose livelihoods depend on the pulp mill and who are willing to live with the “smell of money.” It’s about people whose well-being, health, homes, water, air, and businesses have been harmed by the mill’s emissions and effluent. It’s about the heartache such divisions cause and about people who, for the sake of peace, keep their thoughts about the mill to themselves. But it’s also about hope, giving voice to those who led the successive groups that have protested and campaigned for a cleaner mill–First Nations, fishers, doctors, local councillors, tourism operators, artists and musicians, teachers and woodlot owners. Their personal stories are interwoven into a historical arc that traces the mill’s origins and the persistent environmental and social problems it causes to this day. Baxter weaves a rich tapestry of storytelling, relevant to everyone who is concerned about how we can start to renegotiate the relationship between economy, jobs, and profits on one hand, and human well-being, health, and the environment on the other. The Mill tells a local story with global relevance and appeal. View Joan Baxter’s Blog for more about the book and the author. 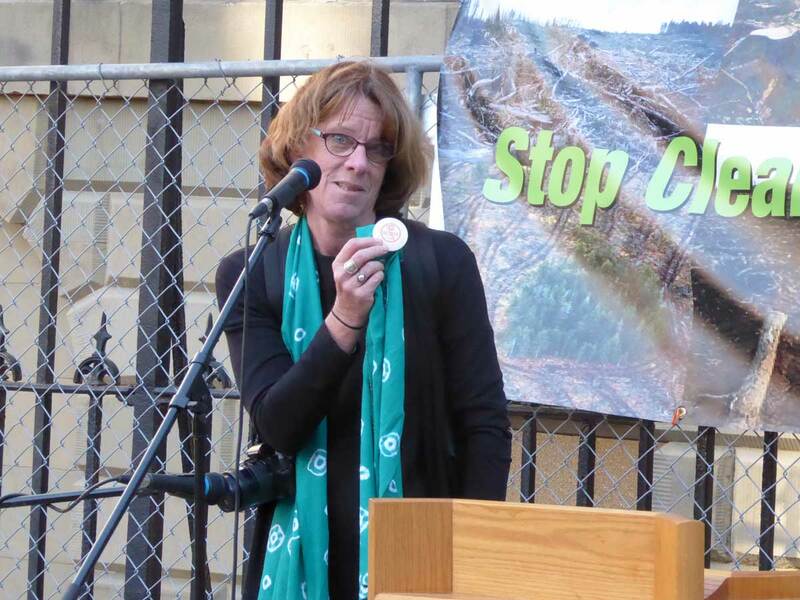 Post on this website, Oct 5, 2017 about Clearcutting our losses: The long history of Nova Scotia sacrificing its forests to big pulp, and why it has to end by Joan Baxter in The Coast, Oct 5, 2017. This entry was posted in Biomass, clearcuts, Pulp & Paper. Bookmark the permalink.